If you have any type of draft beer dispensing system, it’s a good idea to occasionally shut down and clean those beer lines. Health codes hopefully demand regular cleanings for taverns like your local watering hole. Cleaning the home tapper requires just a little common sense and some inexpensive chemicals. In a nutshell, you simply need to flush the system with a sanitizer solution that dissolves residue and kills any bacteria. Cleaning for home systems should be done between kegs or before you shut down the system for prolonged periods. It’s also not a bad idea to flush the system again before you start-up again. What’s the danger of not cleaning beer lines? Over time, bacteria, yeast and mold can form in the beer lines, tap coupler and tower. They live and thrive on leftover hardened beer residue in the lines. Delaying cleaning only helps harden the tasty residue. With that, you’ll be sure to clean immediately before and after each new keg. These bugs won’t kill you or make you deathly ill, but they may produce some unwanted taste. Likewise, using too much cleaner or bleach can create some nasty tasting brew at least for the first a few glasses. You’ll need to pump liquid through your beer lines, so a plastic bottle with a hand pump will do the job. For my home bar, I use a one gallon ordinary garden style plastic weed sprayer filled with water and a cap full of ordinary chlorine bleach. When I shut down the system, I flush the bleach mixture to remove the last of the beer in the lines and the bleach kills the bugs. Then, before tapping a new keg, Ill do the same just to be sure no other microscopic critters have taken up residence in the lines. Of course I dedicate this plastic sprayer to this task only…not spraying weeds too. I have a plastic barb fitting on the end to connect to my beer lines. You may have to improvise. See recommended sprayer type below. Available on Amazon. Where can I find supplies to clean my beer lines? 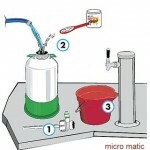 If you don’t want to mess with improvising a cleaning set up, Micro Matic has a beer line cleaning kit. Click the banner below for more information on beer line maintenance, parts and accessories.